Prototype: German Federal Railroad (DB) class VT 10.5 "Senator" daytime articulated train. The train consists of 2 powered cars, 1 open seating car, and 1 car with a galley. The paint scheme is as the train looked when delivered in 1953/1954. Model: The train has an mfx digital decoder, controlled Softdrive Sine high-efficiency propulsion, and a sound generator in powered car A. The train has a compact design, maintenance-free motor. 2 axles powered in the truck for powered car A. Traction tires. The dual headlights and red marker lights, interior lighting and table lamps with maintenance-free warm white LEDs will work in conventional operation and can be controlled digitally. There is a special multiple conductor current-conducting cable and close fitting diaphragms between the cars. The train has a pickup shoe changeover feature. The train has a reproduction of a closed Scharfenberg coupler (non-working) at both ends. Train length over the couplers 69.1 cm / 27-3/16. Powered rail car train constructed of metal. Softdrive Sine high-efficiency propulsion and a sound generator in one powered end car. Table lamps can be controlled digitally. Electrical connections through the entire train. Pickup shoe changeover with the direction of travel. The 39100 powered rail car train is being produced in 2008 in a one-time series only for Insider members. VT 10.5 - Senator by Day, Komet by Night. At the start of the Fifties, the German Federal Railroad (DB) developed two articulated powered rail car trains for long distance service. Franz Kruckenberg, who had already made a name for himself in the Thirties with fast vehicles, participated in the design. 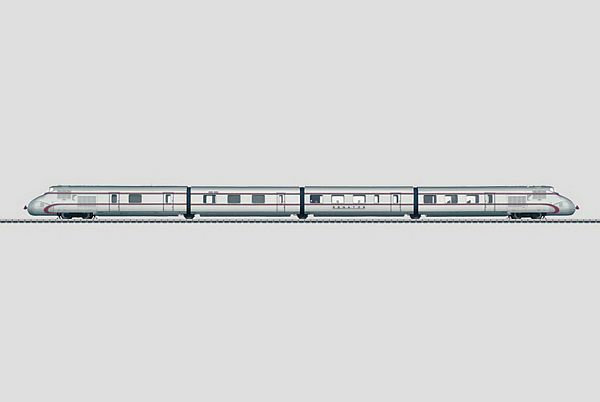 In the development of the two powered rail car trains, he was able to go back to valuable experience that had already been made with the Rail Zeppelin and the SVT 135 155: high speed resulting from largely all-aluminum lightweight construction. These two articulated powered rail car trains were presented for the first time at the German Transportation Exhibition (DVA) in Munich in 1953: The VT 10 501, built by Linke-Hofmann-Busch as a daytime train Senator for the DB, and the VT 10 551, built by Wegmann as the overnight train Komet for the German Sleeping Car and Dining Car Company (DSG). In addition to their use and paint scheme, these two trains also had design differences. While the cars for the Senator were equipped with single-axle running gear, the Komet had Jacobs trucks between the cars. The end cars on both trains each had a two-axle power truck. MAN diesel motors with originally a performance of 118 kilowatts / 158 horsepower, later with 154 kilowatts / 206 horsepower, were used in the motor cars. The maximum speed was 120 km/h / 75 mph; a planned increase to 160 km/h / 100 mph was not carried out. The power transmission was done hydraulically by means of a four-speed transmission. The Senator offered its passengers 135 seats in 1st class, 24 of them reclining seats. The trains went into regular service with the beginning of the summer schedule in 1954. The daytime train, road no. VT 10 501 as Ft 41/42 Senator on the route Frankfurt/Main - Hamburg, the overnight train as Ft 49/50 Komet between Hamburg and Basle (starting in the summer of 1955 to Zurich). The running characteristics of the overnight train received a positive evaluation. Those of the daytime train were the opposite according to DB documents: All things considered, it is apparent that the freight car characteristics cannot be removed from this train. The Senator was in use until June of 1956, was rebuilt several times and tested in experimental runs. In 1959, it was taken out of operation and in 1962 was scrapped. All of the cars from the two trains were scrapped except for the intermediate car VT 10 551i from the overnight train that is used by Nurnberg railroad enthusiasts as a home for their club. The experiences with the two Kruckenberg designs fed the development of the subsequent DB VT 11.5 TEE powered rail car train. This model can be found in a DC version in the Trix H0 assortment under item no. 22797.